Are you working on creating the perfect outdoor living space? We’ve found 9 DIY projects for your patio that are sure to amp up its style and functionality. Take a look below and visit the links to access tutorials for each project. 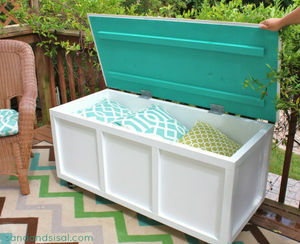 This DIY patio table with built-in ice boxes on Remodelaholic is absolutely fabulous! But be forewarned that it does require someone who is a little skilled with building furniture, because the tutorial has you piecing together the entire table. This design could also be downsized into a coffee table, if it fits your patio layout better. Quick tip: For an extra special touch for evening parties, through a couple glow sticks into the ice to make the ice boxes glow. Want an ice chest, but don’t need a whole table? 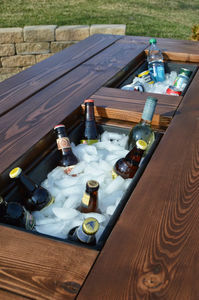 This DIY patio cooler from Projects with Pete converts a portable Igloo contour cooler into a stylish cedar ice chest with wheels, drain spout, and bottle opener. 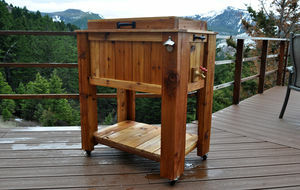 The website has free downloadable plans and a video to watch. The cost is estimated to be just $190. 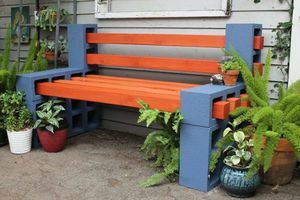 This cinder block bench from Sarah Hamilton on eHow is sturdy and weather-resistant. Yes, it’s a little heavy, but it’s easy to assemble. Plus, it’s a fun way to add a bit of color to your patio. It costs less than $100 to make and is sure to last a long time. The website has a great step-by-step tutorial with pictures. Need an extra place to store patio pillows, gardening tools, etc.? This simple DIY patio/deck storage box from Sand & Sisal is the perfect answer. There’s a full tutorial located on their website and the colors can be altered to match your current patio décor. It’s also possible to alter the plans to convert the top for extra seating. Just add some molding to the lid and a set of cushions. This terracotta pot table from Dukes & Duchesses is not only bright and cheerful, but pulls double duty as a storage container. It’s super easy to make and can be customized with paint colors to match your home and patio furniture. 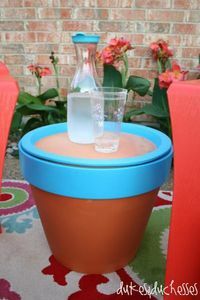 Plus, you can choose whichever size terracotta pot that fits the height of your chairs. 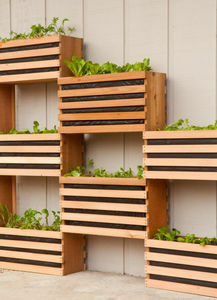 If you have a small patio and/or a small back yard, but still want to grow some vegetables or flowers, this vertical vegetable garden from ManMade is a great solution. It’s customizable to your particular space. You just need an open wall to attach it to. If you’re lucky, there may even be a workshop at your local Home Depot. Need some extra privacy for your patio? 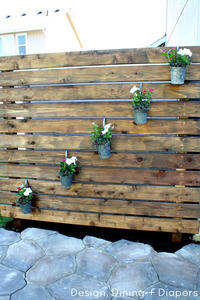 This garden slat wall from Design, Dining, and Diapers is easy to make and its design makes it perfect for hanging plants (think of an herb garden or trailing flowers). It can also be altered to the perfect length for your patio or put two together and wrap them around two sides. 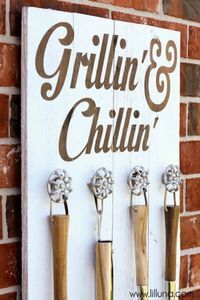 This DIY grill set holder from Lil’ Luna is a cute way to organize your grilling tools. The fun lettering at the top just scream summer fun and it could very well be made with scrap supplies you have laying around the house. You can see the full tutorial on the website. Here’s another great one from Lil’ Luna. 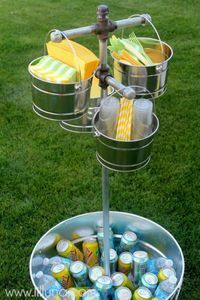 It’s a beverage station made with galvanized pipes and buckets. If you host a lot of events with kids or have a group that plays outside together during the warmer months, this is the perfect addition to your patio. It’ll allow them to easily grab and go. It’s also great for adults during bar-be-que season. 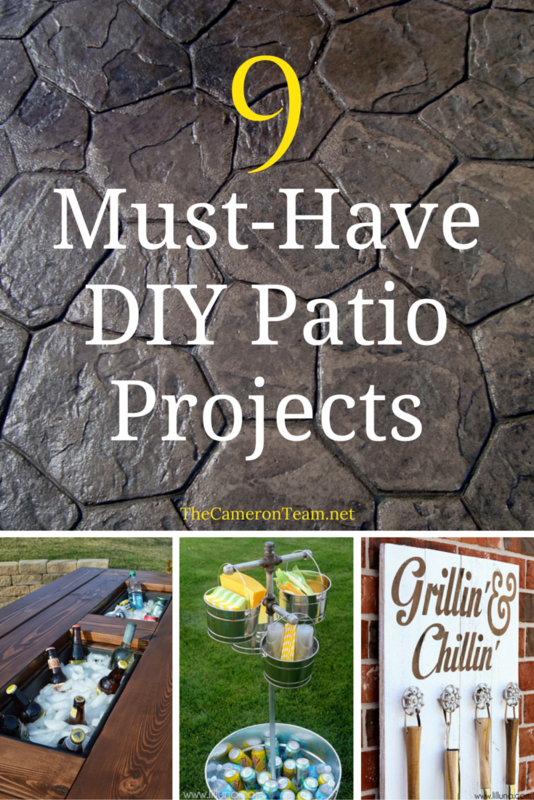 Have you found a great DIY patio project? Share it in the comments!